Who are these groovy elephants in my house? I blame the Elephantom! In 2013, the National Theatre created a new show for the Shed, a place where we had already seen a brilliant version of Romeo and Juliet. Because we’d really enjoyed our experience in this venue, I was a bit sad that the busy festive season meant we could not see the Elephantom. At the time, I remember seeing the bright blue elephant on posters around town and thinking how joyously cheeky this giant pachyderm looked. The show is based on Ross Collin’s book the Elephantom that I refrained from reading before the show. Why? Simply because I did not want us to have any expectations. That being said, it became clear that we were part of a minority once in the London New Theatre since most of the children around us not only knew the story very well, but some had even brought their favourite toy elephant(s)! This show revolves around a little girl whose house becomes haunted by a big fat elephantom. At first, because her parents seem too busy and too self-absorbed, she is delighted to have a new companion. However things degenerate quickly and the elephant’s tricks start to get her in trouble. Her parents, who are obviously incapable of seeing the elephantom, can only notice the havoc it causes and blame her. The family’s well-oiled morning routine is impeccably rendered by the live music and the actors’ impressive choreography. As a result, it is both a shock and a delight when things start to unravel as the elephant tries to pour tea over the mother’s head or steals the parents’s toasts. But the worst for the little girl and the best (for us anyway) is still to come since the elephantom invites his buddies for a crazy party which turns the house upside down! This fiesta had my children dancing on their seats to the tunes of Mc Hammer’s Can’t Touch This and Dee Lite’s Groove is in the Heart and there were many other kids who, like them, could barely refrain from joining the four giant elephants dancing around the theatre! 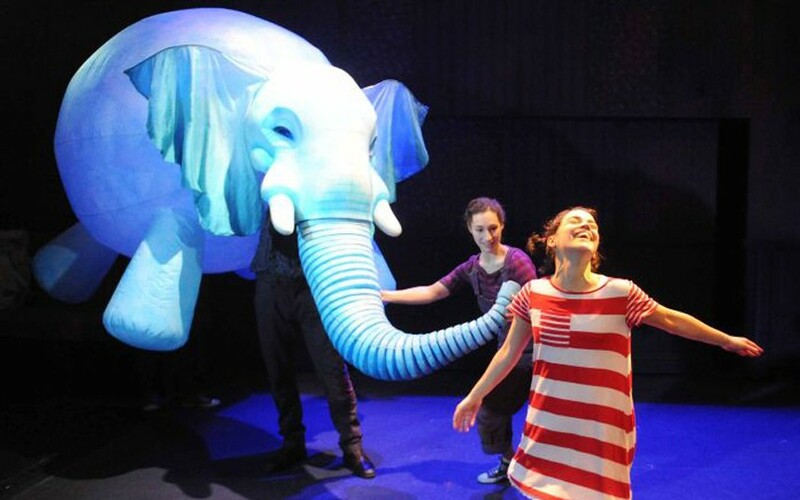 The second part of the show, when the little girl gets her grandmother to help her deal with the increasingly disruptive and fast growing elephantom, was a little bit nebulous for my four year old son. He did not seem to understand why she was looking for a shop offering ghost removal services, or how the box she was to take home was going to help. My older daughter however loved seeing the little girl fly and jump over obstacles carried by the multi-talended actors/puppeteers. She was full of questions about the making of the puppet and, once at home, we enjoyed watching this video showing the making of the show, the rehearsals, and the work that the actors have put in. 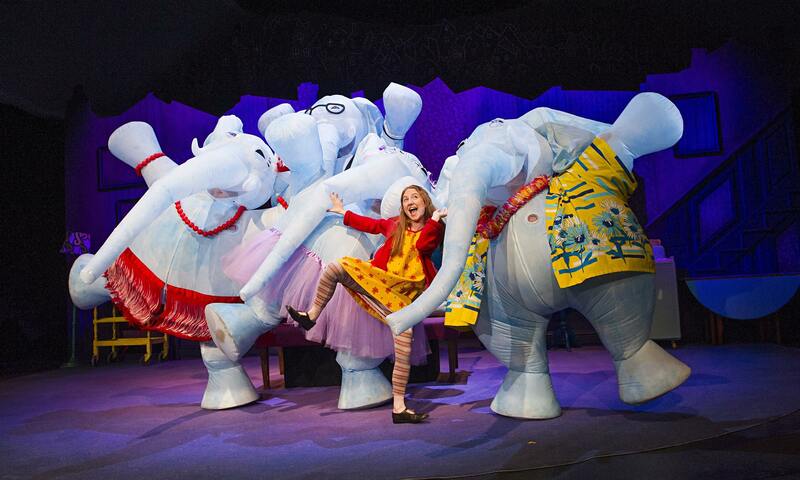 And of course, since then we’ve been re-enacting the crazy disco and pretending we are big and clumsy elephants! I can’t help but wonder but how my children did not even notice that there was barely any dialogue. Anyone (regardless of their language ability) could see this show and enjoy it thanks to Adam Pleeth’s live music, the brilliantly animated puppet and the magic character of this story. For another (happy) take on the show, read Sarah McIntyre’s post after her visit at the Shed, and expect at least another couple of posts about elephants on this blog in the near future.